Between the Lines: What makes good coaches great? The clutch gene: Can athletes be taught to perform under pressure? Sports Medicine Spotlight: Is foot pronation as bad as it seems? Pulaski’s Field of Dreams: Wisconsin school district overcomes obstacles to begin on long-awaited facilities project. 2017 Buyers’ Guide: Get the information you need about the companies that distribute any product you’ll ever want for your program. Between the Lines: Do we need replay in prep sports? 2016 Buyers’ Guide: Get the information you need about the companies that distribute any product you’ll ever want for your program. 2015 Buyers’ Guide: Get the information you need about the companies that distribute any product you’ll ever want for your program. Your Voice – Is your program equipped to protect athletes? Your Voice – Is cursing an issue in your athletic program? Your Voice – Is illegal recruiting a problem in high school sports? Your Voice – Are coaches responsible for backing off in blowout games? Your Voice – Should high schools test athletes for performance enhancing drugs? 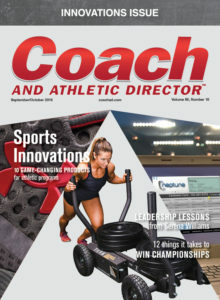 Q&A – What legal issues concern athletic directors most? Sports Medicine Spotlight – A ‘sick’ scapula: is that contagious? Q&A – How do you recruit and retain volunteers to work at sporting events?